Railcards allow you to buy discounted train tickets for travel in the United Kingdom. There are a wide range of Railcards available including Railcards for seniors, for travellers aged between 16 and 26 and for two or more travellers travelling together that are valid for travel throughout the United Kingdom. There are also some Railcards available to everyone regardless of their age, although these are restricted to travel within a specific geographic area. Railcards are different to rail passes in that they do not entitle you to any travel on their own, but instead entitle you to a discount on any train tickets you purchase. Discounts are usually around one third off the price of your ticket and in most instances you can also use a Railcard to get discounted travel on Rover and Ranger rail passes. If you’re eligible for a national Railcard, these are the ones you want to get as they offer you discounted rail travel throughout the United Kingdom. The 16–25 Railcard is a great deal if you’re aged between 16 and 25 and it is also available to mature students aged 26 and older who are in full-time education in the UK. The 16–25 Railcard gives you one third off the cost of standard anytime, off-peak, standard advance and first class advance purchase fares for travel throughout the UK. Most Ranger and Rover rail passes will also extend the discounted fare to holders of a 16–25 Railcard. It usually only takes three or four journeys for the Railcard to pay for itself and the average user saves £179 in a year. This Railcard costs £30 for one year and a three-year 16–25 Railcard is available for £70. You can buy or renew your 16–25 Railcard up to the day before your 26th birthday and it will remain valid for a full year, in essence giving you an extra year of discounted rail travel. You can buy a three-year 16–25 Railcard up to the day before your 24th birthday, which will keep it valid up to the day before your 27th birthday. You can buy your 16–25 Railcard either online or at most railway stations in Great Britain. When you purchase your Railcard you will need to have either a passport, a UK drivers licence or a European national identity card as proof of your identity and date of birth and if purchasing your Railcard online you will also need to upload a photo in .jpg or .gif format with a resolution of at least 300 DPI with a file size not exceeding 2MB. Machine readable passports from all countries (except passports from Bangladesh and the Philippines issued prior to 2010) are accepted. If you buy your Railcard online it will be despatched within one working day and delivered by first class post. However you should allow five working days for delivery within the UK. When you purchase your Railcard online it will be valid an additional week to compensate for the delivery time. Railcards purchased online can only be delivered to addresses in the United Kingdom. If you want to buy your Railcard prior to arriving in the UK you may be able to use your hotel address (although it is best to check with your hotel to see if they are able to receive mail for guests). You can also buy your Railcard from most train stations in Great Britain including stations at Gatwick Airport, Stansted Airport, Luton Airport Parkway and Manchester Airport, but not at Heathrow Airport. You will need either your passport or UK drivers licence as proof of age plus a UK delivery address and a photo to upload, which will be printed on your Railcard. 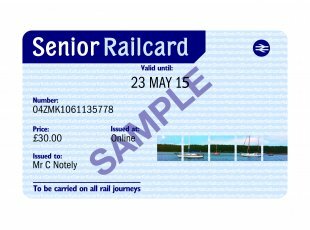 The Senior Railcard is a great deal if you’re aged 60 and over. The Senior Railcard gives you one third off the cost of standard anytime, off-peak, standard advance and first class advance purchase fares for travel throughout the UK. Most Ranger and Rover rail passes will also extend the discounted fare to holders of a Senior Railcard. It usually only takes a couple of journeys for the Railcard to pay for itself and the average user saves £114 in a year. This Railcard costs £30 for one year and a three-year Senior Railcard is available for £70. You can buy a one-year Senior Railcard either online or at most railway stations in Great Britain. Three-year Senior Railcards can only be purchased online. You can buy your Senior Railcard online up to two weeks prior to your 60th birthday, but it will only be valid from your birthday onwards. You will need to be 60 years or older if you buy your Railcard at a train station. When you purchase your Railcard you will need to have either a passport or a valid UK drivers licence as proof of your identity and date of birth and if purchasing your Railcard online you will also need a valid debit or credit card. Machine readable passports from all countries (except passports from Bangladesh and the Philippines issued prior to 2010) are accepted. You will need either your passport or UK drivers licence as proof of age plus a UK delivery address and a debit or credit card. If you buy your Railcard online it will be despatched within one working day and delivered by first class post. You should allow five working days for delivery within the UK. The Family & Friends Railcard is a great deal for up to four adults when travelling with up to four children aged 5–15. Two adults can be named as cardholders. Both cardholders do not need to travel together, however you do need to travel with at least one child to be eligible for a discounted fare. Up to four adults and four children can receive discounted fares when travelling on the same Railcard. The Family & Friends Railcard gives you one third off the cost of adult fares and 60% off most children’s fares for travel throughout the UK. Most Ranger and Rover rail passes will also extend the discounted fare to holders of a Family & Friends Railcard. It usually only takes a couple of journeys for the Railcard to pay for itself and the average user saves £124 in a year. If you’re travelling with children aged under five years they will be able to travel free of charge. You can travel with up to two children under five years of age with the Family & Friends Railcard. If one or more of your children turn 16 before a one-year Railcard runs out they can still travel at the discounted rate while the Railcard remains valid. If you have a three-year Family & Friends Railcard and your child turns 16 while it is still valid, they are able to travel at the discounted rate until they turn 17. This Railcard costs £30 for one year and a three-year Family & Friends Railcard is available for £70. You can buy a Family & Friends Railcard either online or at most railway stations in Great Britain. The Two Together Railcard is a great deal for two people aged 16 years or older who are travellling together. It is a great deal if you’re not old enough to qualify for either a 16–25 Railcard or a Seniors Railcard. The Two Together Railcard gives you one third off the cost of adult fares. 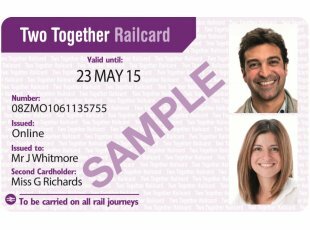 Most Ranger and Rover rail passes will also extend the discounted fare to holders of a Two Together Railcard. It usually only takes a couple of journeys for the Railcard to pay for itself. This Railcard costs £30 for one year. You can buy a Two Together Railcard either online or at most railway stations in Great Britain. If you buy your Railcard online you will need two separate digital photos (one for each person named on the Railcard) to upload during the online purchase process as well as a valid debit or credit card and a UK mailing address. You will need two digital photos plus a UK delivery address and a debit or credit card. The Disabled Persons Railcard is a great deal for if you have a disability that makes travelling by train difficult. The Disabled Persons Railcard also extends the discount to a friend who is travelling with you. The Disabled Persons Railcard gives you one third off the cost of adult fares. Most Ranger and Rover rail passes will also extend the discounted fare to holders of a Disabled Persons Railcard. It usually only takes a couple of journeys for the Railcard to pay for itself. You generally need to be a UK resident who has a hearing or visual impairment, is prohibited from driving because of epilepsy or receives a disability allowance. You can check the eligibility requirements for the Disabled Persons Railcard here. Unlike other Railcards, the Disabled Persons Railcard entitles you to discounted travel at all times with no restrictions for peak hour travel. This Railcard costs £20 for one year. A three-year Disabled Persons Railcard costs £54. You can buy a Disabled Persons Railcard either online or by downloading an application form and sending it along with payment and proof of eligibility to the address on the form. 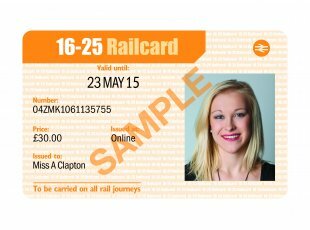 If you buy your Railcard online you will need a digital photo or scan of your proof of eligibility to upload during the online purchase process as well as a valid debit or credit card and a UK mailing address. You will need a digital photo or scan of your proof of eligibility plus a UK delivery address and a debit or credit card. The HM Forces Railcard gives members of the Regular Armed Forces and the Volunteer Reserves and their spouses one third off adult train tickets and 60% off child fares. Most Ranger and Rover rail passes will also extend the discounted fare to holders of this Railcard. The HM Forces Railcard gives you discounted leisure train travel only. It can not be used for commuting to a place of work or study. This Railcard is restricted to members of the UK armed forces and their spouses. You can check the eligibility requirements for the HM Forces Railcard here. This Railcard costs £17 for one year. You must see your Unit HR administration staff to apply for your HM Forces Railcard. The cost of the Railcard will be deducted from your pay. If you are a war widow or one of their dependents, you can apply for your HM Forces Railcard through the Royal British Legion. Applicants not serving in the British armed forces must be in receipt of a Forces Family pension. The HM Forces Railcard cannot be purchased from train stations. If you’re too old or too young to be eligible for a national Railcard there are several regional Railcards that offer discounted rail travel within a specific geographic area. Most of these Railcards are restricted to local residents, but some of them – such as the Cotswold Line Railcard and the Network Railcard – are open to everyone including people visiting the area. Most of these Railcards are restricted to local residents, but some of them – such as the Cotswold Line Railcard and the Network Railcard – are open to everyone including people visiting the area. The Cambrian Railcard gives local residents a 33% discount on Arriva Trains Wales trains standard class fares in the Cambrian region of Wales. It is valid for rail travel on the Pwllheli–Aberystwyth–Machynlleth–Newtown–Shrewsbury route including intermediate stations. The Cambrian Railcard cannot be combined with other discounts including Ranger or Rover tickets. The Cambrian Railcard is only available to local residents who live in one of the following postcodes: LL35 0, LL36 0, LL36 9, LL37 2, LL38 2, LL39 1, LL40 1, LL40 2, LL41 3, LL42 1, LL43 2, LL44 2, LL45 2, LL46 2, LL47 6, LL48 6, LL49 9, LL52 0, LL53 5, LL53 6, LL53 7, LL53 8, SA45 9, SA46 0, SA47 0, SY15 6, SY16 1, SY16 2, SY16 3, SY16 4, SY17 5, SY18 6, SY19 7, SY20 8, SY20 9, SY21 0, SY21 7, SY21 8, SY21 9, SY23 1, SY23 2, SY23 3, SY23 4, SY23 5, SY24 5. This Railcard costs £5 per year. You need to complete an application form and take it along with proof of your identity and proof of address (such as a council tax or utility bill) to either Aberystwyth or Machynlleth railway station. Alternately you can post the form (along with a photocopy of your proof of residence and a cheque made payable to Arriva Trains Wales) to either Aberystwyth or Machynlleth railway station. The Cotswold Line Railcard entitles you to a 34% discount on off-peak single and return tickets and anytime day tickets on the GWR trains on the line linking Worcester Foregate Street and Oxford (including stops at intermediate stations). This Railcard costs £7.50 for one year and can be used when off-peak tickets are available. Discounted travel is only available when purchasing tickets from ticket offices at stations along the Cotswold Line and this Railcard cannot be used to obtain discounted tickets from online ticket retailers. The Cotswold Line Railcard is available from the following stations: Worcester Foregate Street, Worcester Shrub Hill, Evesham, Moreton-in-Marsh, Kingham, Charlbury and Oxford. It is also available on board trains when ticket offices at these stations are closed or if you are travelling from an unstaffed station. The Dales Railcard gives local residents a 33% discount on Northern trains services in the Yorkshire Dales including the Settle–Carlisle line, Brampton and Wetheral on the Tyne Valley line and Clitheroe & Whalley to Hellifield and stations to Carlisle and vice versa. It is not good for discounts on travel exclusively in the Leeds/Bradford–Skipton area nor for travel exclusively between Carnforth, Lancaster, Bare Lane and Morecambe. It is good for discounts on anytime day single, anytime day return or anytime return tickets as well as discounts on the Settle–Carlisle Line Day Ranger ticket. The Dales Railcard is only available to local residents who live between Skipton and Carlisle, Skipton and Carnforth, Carlisle and Brampton and Clitheroe/Whalley and whose postcode includes the following: CA 1, CA 2, CA 3, CA 4, CA 6, CA 8, CA 9, CA 10, CA 11, CA 16, CA 17, DL 8, DL 11, DL 12, LA 2, LA 5, LA 6, LA 10, BD 23, BD 24, BB7. Discounted travel is only available when purchasing tickets from ticket offices at stations and this Railcard cannot be used to obtain discounted tickets from online ticket retailers. The Dales Railcard offers holders discounts at local businesses including cafes, pubs and hotels in the region. This Railcard costs £13 per year. You need to complete an application form and take it along with proof of your identity and proof of address (such as a council tax or utility bill) to Appleby, Carlisle, Carnforth, Settle or Skipton railway station. The Devon and Cornwall Railcard is one of the better regional Railcards as it covers two counties rather than one or two rail lines, however it is restricted to local residents. The Devon and Cornwall Railcard can only be used for standard class off-peak travel wholly within Devon or Cornwall. It cannot be used for tickets that extend beyond Devon and Cornwall, for first class travel or for travel during peak hours. This Railcard is only available to residents of Devon and Cornwall aged 16 or older. You must present either a bank/credit card statement, council tax bill, drivers licence or utility bill to prove your residency. Discounted travel is only available when purchasing tickets from ticket offices at stations in Devon and Cornwall and this Railcard cannot be used to obtain discounted tickets from online ticket retailers. The Devon and Cornwall Railcard is available from any staffed station in Devon and Cornwall. You will be required to prove your residency and identity and complete and application form. The Esk Valley Railcard gives local residents 34% discounted fares on the Esk Valley line between Middlesbrough and Whitby as well as discounted travel on the North Yorkshire Moors Railway. The Railcard costs £10 and is valid for one year. This Railcard is only available to local residents aged 16 or older who live in the Hambleton, Scarborough or Ryedale Districts of North Yorkshire and the Boroughs of Middlebrough, Redcar, Cleveland or Stockton who have one of the following postcodes: DO 7, DO 8, DL 2, DL 6, DL 10, HG 4, TS 1, TS 9, TS 10, TS 13, TS 15, TS 19, YO 1, YO 3, YO 4, YO 6, YO 7, YO 11, YO 12, YO 13, YO 14, YO 17, YO 18, YO 19, YO 21, YO 22, YO 25, YO 26, YO 30, YO 32, YO 41, YO 60, YO 61, YO 62. It can be purchased at ticket offices at the following railway stations: Malton, Middlesbrough, Redcar Central, Scarborough, Thirsk, Thornaby and Whitby. The Heart of Wales Railcard gives local residents 34% discounted fares on standard day return, cheap day return and saver return tickets on trains operated by Arriva Trains Wales between Swansea/Llanelli to Shrewsbury via Llandrindod Wells. The Railcard costs £5 and is valid for one year. This Railcard is only available to local residents aged 16 or older who live in selected postcodes along the Heart of Wales line. It can be only be purchased at the ticket office at Llandrindod Wells railway station. The Highland Railcard gives local residents 50% discounted fares on the following routes operated by ScotRail: Mallaig/Fort William/Oban to and from Glasgow, Wick/Thurso to and from Inverness and Kyle of Lochalsh to and from Inverness. The Railcard costs £9 and is valid for one year. This Railcard is only available to local residents aged 16 or older who live in the following postcodes: All IV postcodes (except: IV12, IV30, IV31, IV32, IV36), all KW postcodes, all HS postcodes, PA20 to PA38, PA41 to PA49, PA60 to PA78, PH16, PH17, PH30 to PH44, PH49, PH50, FK20, FK21, G83. It can be purchased at ticket offices at the following railway stations: Dingwall, Fort William, Inverness, Kyle of Lochalsh, Mallaig, Oban and Thurso. It can also be purchased by mail by sending a completed application form along with proof of residence (such as a bank statement, drivers licence or utility bill). The Network Railcard is the most useful of the regional Railcards as it includes most of southeast England including London and is available to everyone aged 16 years or older, not just local residents. The Network Railcard entitles the holder to up to a 33% discount off standard adult fares (subject to a minimum fare) in the Network Railcard area, which includes London and southeast England and extends as far as Northampton, Bedford, Cambridge, Kings Lynn, Harwich, Dover, Brighton, Portsmouth, the Isle of Wight, Southampton, Bournemouth, Weymouth, Exeter, Salisbury, Bedwyn, Oxford, Worcester, and Banbury. The Railcard also gives discounted travel on inclusive train and bus (PLUSBUS) tickets and also on Wightlink and Red Funnel ferry services to the Isle of Wight. It is not valid for travel before 10am Monday–Friday (except on bank holidays) and there is a £13 minimum fare on all journeys made Monday–Friday (except on bank holidays). A major benefit of this Railcard is that up to three other adults can travel with you and they will also benefit from a 33% discount off their ticket. The Network Railcard costs £30 and gives you discounted travel for one year. You can buy your Network Railcard either online or at most railway stations in the Network Railcard area. Virtually all railway stations in southeast England sell this Railcard with the exception of unstaffed stations, Heathrow Airport station and London Underground and Docklands Light Rail stations. The Pembrokeshire Railcard gives Pembrokeshire residents aged 16 and older a 34% discount of rail travel within Pembrokeshire and to Carmarthen and Swansea. The Pembrokeshire Railcard is only available to people aged 16 or older who live in the following postcodes: SA34 0, SA61 1, SA61 2, SA62 3, SA62 4, SA62 5, SA62 6, SA63 4, SA64 0, SA65 9, SA66 7, SA67 7, SA67 8, SA68 0, SA69 9, SA70 7, SA70 8, SA71 4, SA71 5, SA72 4, SA72 6, SA73 1, SA73 2, SA73 3. It can only be purchased from Carmarthen and Haverfordwest train stations and you must proof of residence in one of the above postcodes.